Description: Perfectly located, only 700 metres from Toormina shopping centre, library, doctors and services, this spacious home has been upgraded both externally and internally. 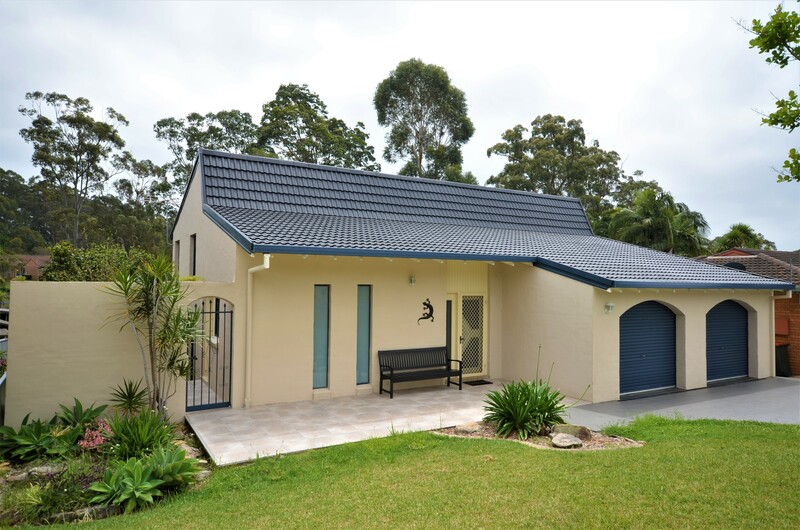 Rendered with a recently re-furbished roof and tiled driveway to give it a contemporary look, and located on a gently sloping 797sqm block, the home is perfect for the growing family or even the downsizers wanting a super convenient location. The split-level design has the bedrooms on the top level along with the renovated ensuite and walk in robe to main, the middle level is the entry level as well as the renovated main bathroom. Also on this level is the oversized garage ( 7 x 7 m in measurements), there's loads of room for storage and additional height as well, allowing for the addition of a possible mezzanine level for more storage! On the bottom level (only a couple of steps down) there's a choice of living spaces, a generous lounge area, opening onto the deck' as well as the renovated kitchen in crisp white and greys with tiled floor as well as dining/family area, also opening onto the deck. The polished timber floor on this level is the perfect low maintenance flooring whilst the air conditioning keeps the whole area cool in summer and warm in the cooler months. The surprisingly spacious and private yard is overlooked by a massive covered deck, big enough for the largest of family get together and parties. Nothing has been missed in the update, and there's nothing to do but move in and relax.